Create a step-by-step monthly payment plan to get out of debt in less than 10 minutes! Zilch does one thing and does it very well, it gets you out of debt. Your key to financial success... Focus on one debt at a time! You simply enter the Creditor Name, Annual Percentage Rate, Current Balance, and Monthly Payment for each of your credit cards and loans. Our debt reduction software does the rest for you. With the push of a button you instantly create your very own personalized, debt repayment plan. 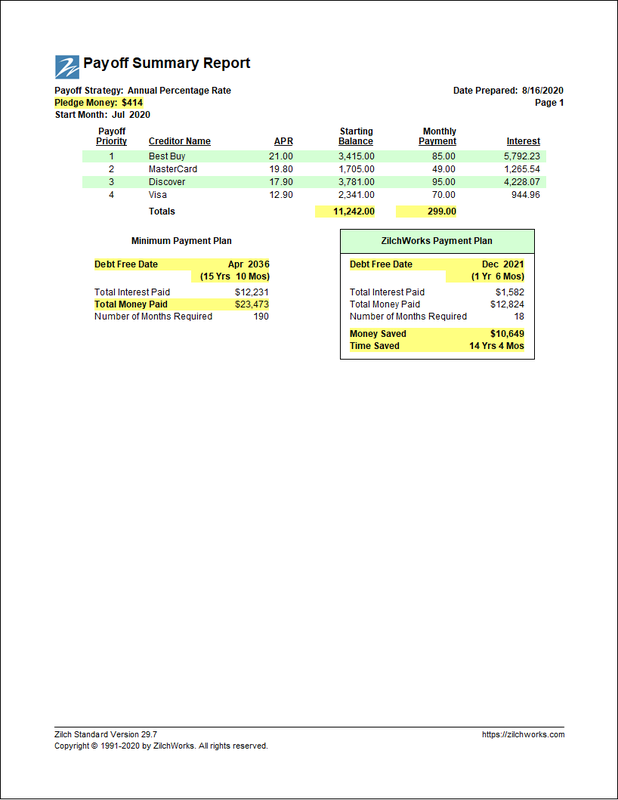 Your plan shows you exactly how much to pay each creditor every single month. No more guessing who you should pay first. No more trying to figuring out the best way to use your hard-earned money to pay off your debt. Our debt reduction software does all of that for you. Would you like to be out of debt in 18-24 months? and instantly turns everything into a step-by-step monthly debt management plan. Do you want to save a ton of money in credit card finance charges? Our debt deduction software analyzes your debts, determines the most efficient way to pay them off, and produces a personalized debt repayment plan that saves you a ton of money. By following your personalized debt repayment plan you will save thousands of dollars in interest penalties. This is real, hard-earned money. This is your money. This is money you are currently giving away to creditors for no reason. Would you like a renewed sense of hope and excitement? Because you instantly see your actual debt-free date, there's a wonderful feeling of hope that comes over you. Hope that immediately turns into belief. A belief that's strong. Why is that belief so strong, because there really is a light at the end of the tunnel. You can see it. You believe it. You know you will get out of debt soon. Now that's exciting. Guaranteed assurance of absolute and complete privacy! Your personal and financial information are never shared with anyone! That's right. 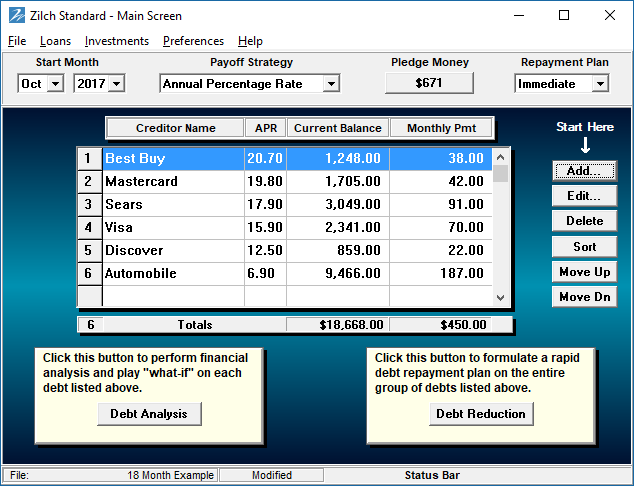 You purchase our debt reduction software and download it to your computer. What you do with our software from that point on is entirely up to you. Finally, you can take advantage of trade secrets used by many expert financial counselors in the privacy and comfort of your own home.